Evocative of ‘The Arabian Nights’, and where solitude is a mystical experience, Jaisalmer, the Last Frontier, will enchant you with sensational miles of nothingness! 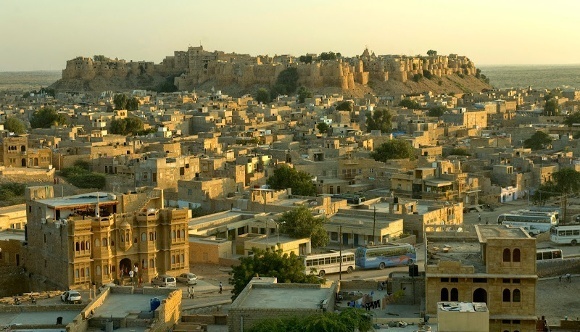 Jaisalmer, the ‘Golden City’ of Rajasthan, is the heart of the Great Indian Desert, otherwise known as the Thar Desert. 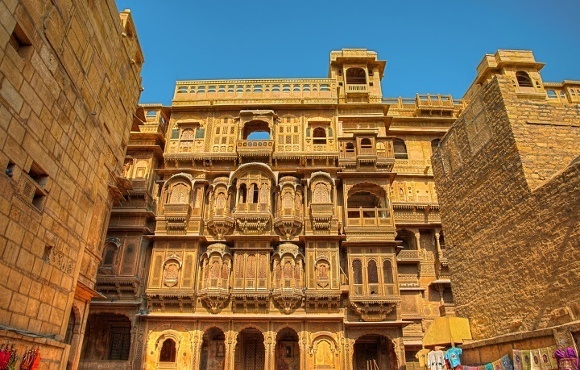 A UNESCO Site, Jaisalmer is perched on a yellow-tinted sandstone ridge surmounted by the lofty Jaisalmer Fort, and boasts many ornate houses, temples and palaces. 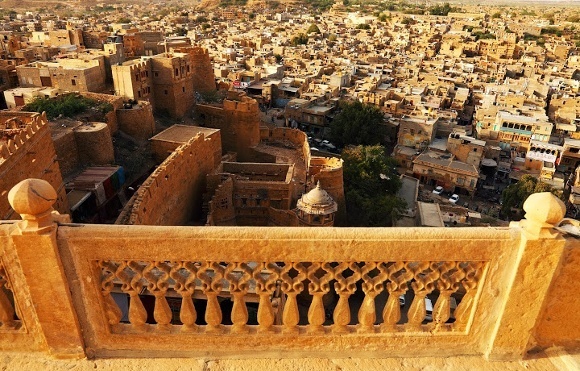 Jaisalmer beckons the discerning traveler with its old-world charm, even as it integrates luxury with creature comforts. 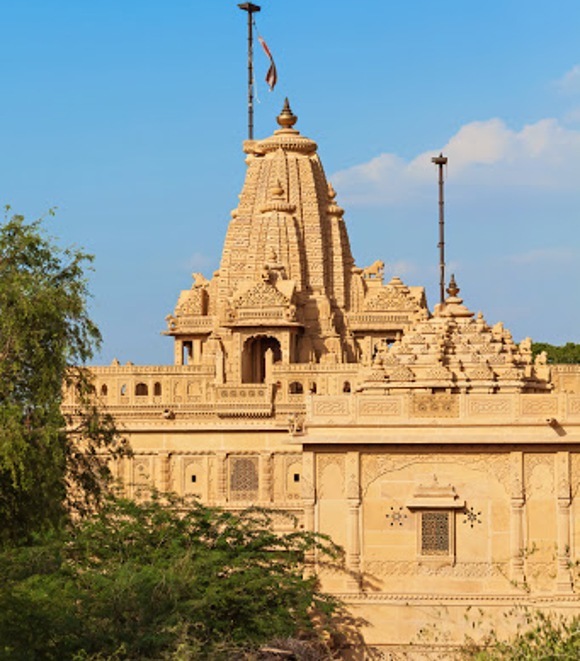 We offer the ultimate insider guide to Jaisalmer’s secret charms and some of the most interesting sights and sounds for you to discover and explore. Jaisalmer’s cityscape is smattered with quaint merchants’ havelis (private mansions) and ancient temples amidst modern infrastructure. Shops display myriad crafts and traditional items. Lose yourself in the maze of alleyways as you delve deeper into this fort city. Observe the frenetic daily life and frenzied markets. From the east to the west stand a long stretch of windmills and the golden miles of nothingness that is the Thar Desert! 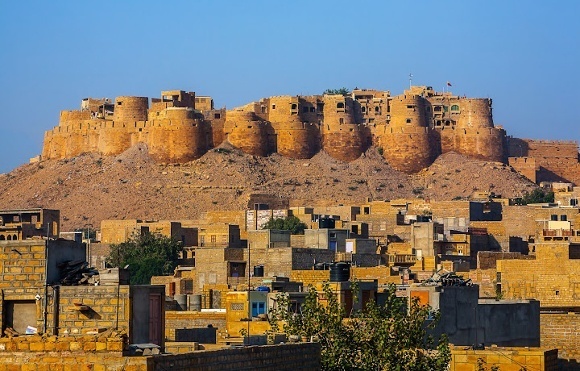 A novel by celebrated author and filmmaker Satyajit Ray portrays the heritage of the enigmatic Jaisalmer Fort, which was later depicted in a movie. Constructed in traditional Rajasthani style, this five-storied structure is separated by three layers of walls rising from the Great Thar Desert. A pride of Rajput architecture, this is one of the world’s largest forts. On the outskirts, just north of Jaisalmer, lies an amazingly calm garden complex. Bada Bagh or ‘Big Garden’, also called Barabagh, boasts a collection of Rajput cenotaphs. 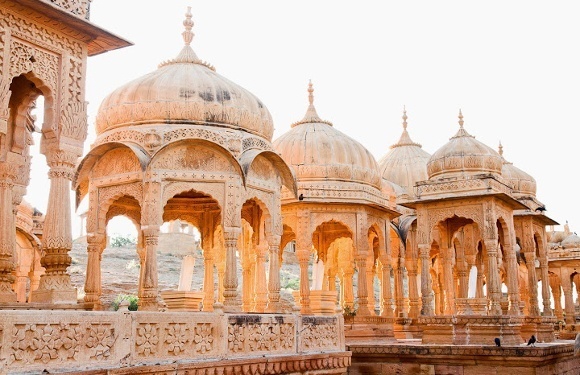 These crumbling royal cenotaphs, made from Jaisalmer’s famous golden stones, were built in memory of the city’s rulers. 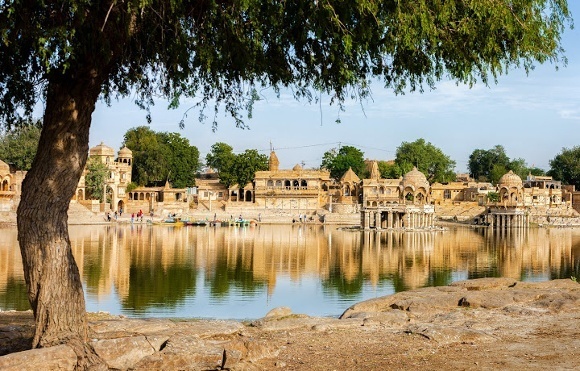 One of the most visited sites in Jaisalmer is the Gadsisar Lake – once the vital water supply reservoir for all of Rajasthan. Built in 1367 by Maharawal Gadsi Singh, this freshwater lake is a symbol of peace and prosperity. Enjoy picnics or paddle-boating while you enjoy spectacular views of the temple at Gadsisar Lake. Patwon ki Haveli is considered one of the biggest havelis (private mansion) in Jaisalmer, although it is actually a cluster of five different havelis wedged into a narrow alleyway. The first ever built in Jaisalmer, the entire haveli comprises of yellow sandstone save for the main gateway which is brown. Built by wealthy merchants in the 18th and 19th centuries, these ornate gateways and arches are skillfully-designed masterpieces. Skirting the edge of Jaisalmer lies the abandoned ghost town of Kuldhara. Most of the village is in ruins save for a sandstone dome-shaped turret and Krishna temple, eerily resonating the haunting tales that surround this 17th century village. Local legends claim that the area surrounding Kuldhara is uninhabitable and that the residents of Kuldhara disappeared from the town overnight! A riot of colors greet you at local markets which sell almost everything. There’s never a dull moment as you weave through quaint stalls. 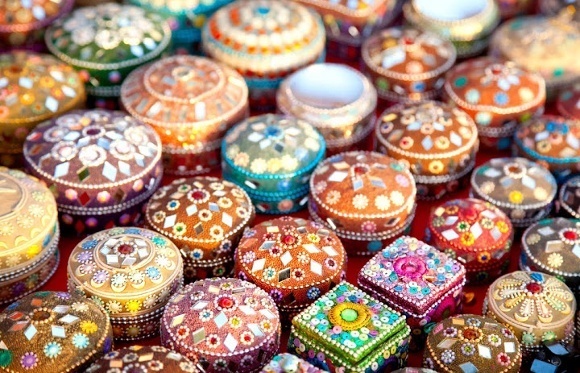 Sift through neon colored turbans, mirror-work outfits, traditional jewelry, hand-crafted carpets and mirror inlaid wooden boxes. 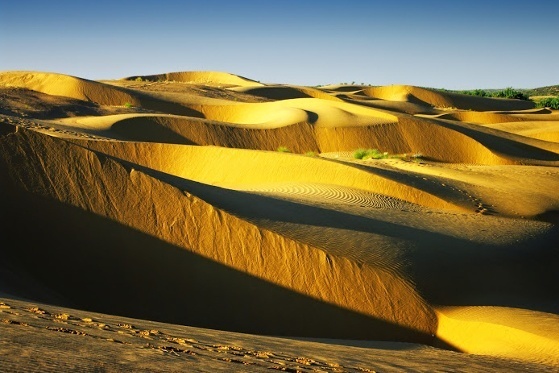 Traverse the golden-hued Thar desert riding camel-back on Sam Sand Dunes, about 45 km from Jaisalmer. Uncover India’s rural life and feel the warm desert air sweep past you. Adventure junkies can experience the thrill of dune bashing or off-roading on a roller coaster SUV-ride through the famous Sam Sand Dunes. Fancy traditional delicacies in Jaisalmer? 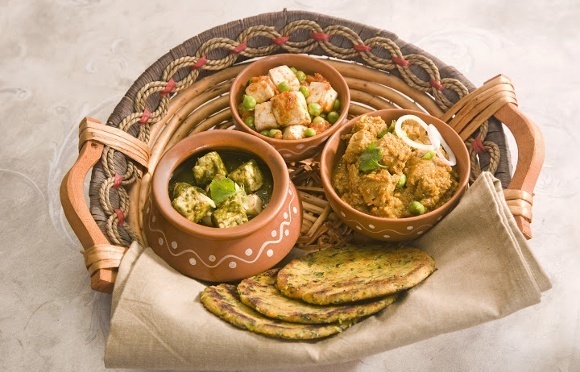 Feast on rich and flavorsome Rajasthani food. Savor some succulent non-vegetarian laal maas or the classic vegetarian dal baati churma, and tempting sweets that are to die for! Affable people, technicolor bazaars, delectable cuisine, sunny skies, warm winds, a golden-hued landscape and a distant horizon with sensational miles of nothingness in between – it’s all quintessentially Jaisalmer! So hop on the bandwagon and head to charming Jaisalmer! 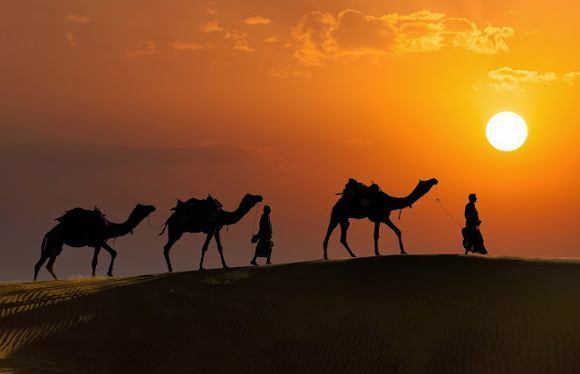 It’s best to visit Jaisalmer between the winter months of October to March, and camel rides, dune riding and many other activities are possible during this time. Don’t miss the exciting Jaisalmer Desert Festival, which takes place in February every year. Our team, comprising of experts on 32 destinations across the world, will exclusively tailor-make travel experiences just for you!